For those Microsoft MVP’s from the past that are not current, there is a new program called the Reconnect program. 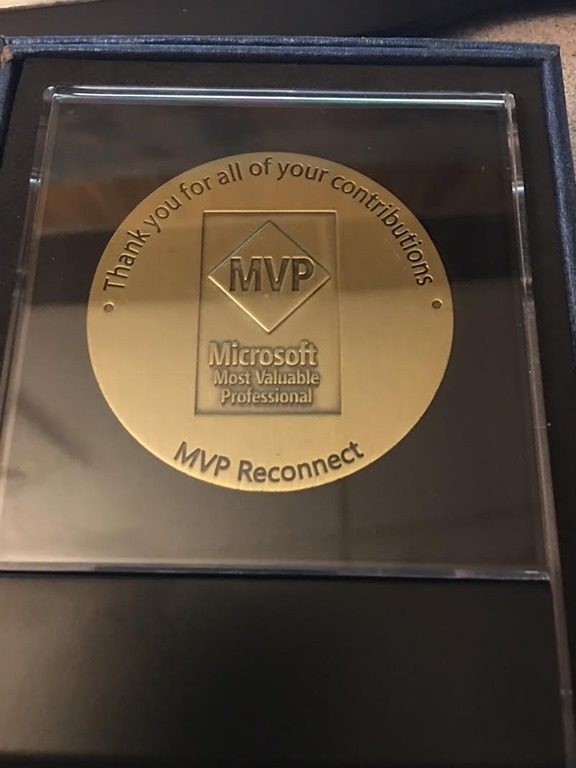 The program is a nice way for Microsoft to recognize your contributions from the past, connect with other former MVP’s using their private Yammer groups, and get some new interactions with Microsoft. 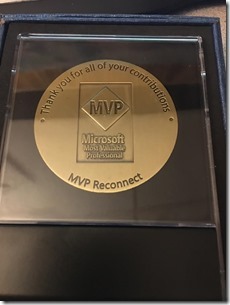 Members of the MVP Reconnect program will also receive a nice MVP coin in a display holder. Being a former MVP myself for the time being, I really appreciate the time and effort Microsoft is putting into this program. I am finding a lot of other great former MVP’s, enjoyed the latest online Skype call, and love the interaction and communication with Microsoft. The Yammer groups are fairly active, with a lot of good conversations going on. From the introduction posts to the sharing of knowledge of Microsoft products to random chit chat, it’s a nice place to visit other former MVP’s. As this is a new program, it is still in the ‘beta’ phase. There is talk of other benefits that you may or may not receive in the future. However, as it currently stands – it’s a great program to be a part of. All former MVP’s that were in good standing are applicable to join. So, if you are a former MVP, I recommend signing up and at least introducing yourself in the Yammer groups! There is a lot more information on the official Reconnect web page. The program is open to all former MVPs, regardless of technical expertise or award category, with a minimum of 1 full MVP Award year. Members must be in good standing, meaning that they must have no Code of Conduct or NDA violations. We believe that having a diverse population will increase the impact of networking and create unique opportunities that were not possible in the past! Put simply, if you are a former MVP, we’d love for you to join! MVP Reconnect will be the official channel for you to stay connected to other community leaders and Microsoft. You will have the opportunity to participate in an exclusive networking channel, events, and private discussions, as well as local and global offerings. If your contributions to the technical community slow down temporarily, staying connected means that you maintain a good position for future recognition as an active MVP. If you have a long history with the MVP program, you’ll be able to share your experiences and coach others to take full advantage of all the opportunities that the MVP Award can provide. This is not a program from Microsoft to the community; this is a program where Microsoft and the community contribute together to have a bigger impact! For this reason, we have decided to have a joint management approach and we are establishing an advisory board. Five to ten members will be part of this board and they will have the responsibility to represent the community and lead the constant evolution of the MVP Reconnect program. They will partner with Microsoft to define new features of the program, consolidate feedback, and evaluate cool new ideas for members. We will have periodic elections to select new board members. As part of a true community, you, through your advisory board representation, will be able to participate in driving new ideas, shaping the community structure, and building this program for the future. After you are approved in the program, we will send you a small thank you gift to show our appreciation.